Steel bar stock of the appropriate thickness, annealed at this stage, is selected. 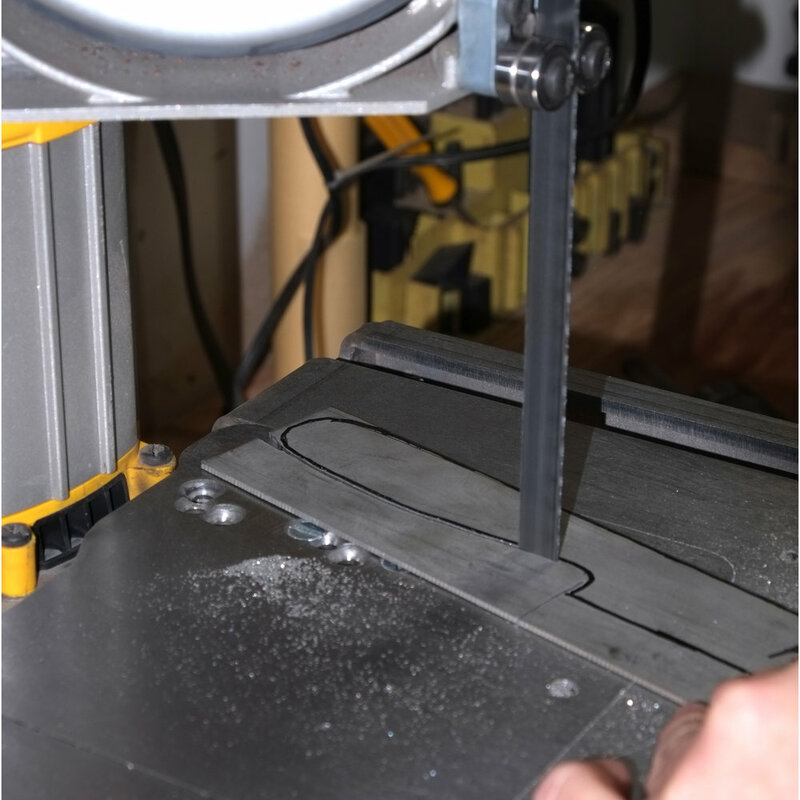 An outline is traced from previously cut knife templates and cut out with the band saw. The shape is further refined on the belt grinder. Holes are located and drilled on the handle both for the eventual placement of pins and to reduce the handle weight and balance the knife. A Selection of knife blanks ready to be sent out for heat treating (hardening). The hardened knives have been returned and the serious work begins - the grinding of the bevels - turning the flat steel into a blade. The machine work is done and the blades are sanded through a succession of grits up to 2000 (really smooth). The most time consuming operation of the process. The blades are given a final polish on a felt belt. The blades ready for handles. Cutting knife scales from a gorgeous maple burl. Surfacing the wood to achieve a flat surface and precise thickness. The prepared scales ready to be glued. 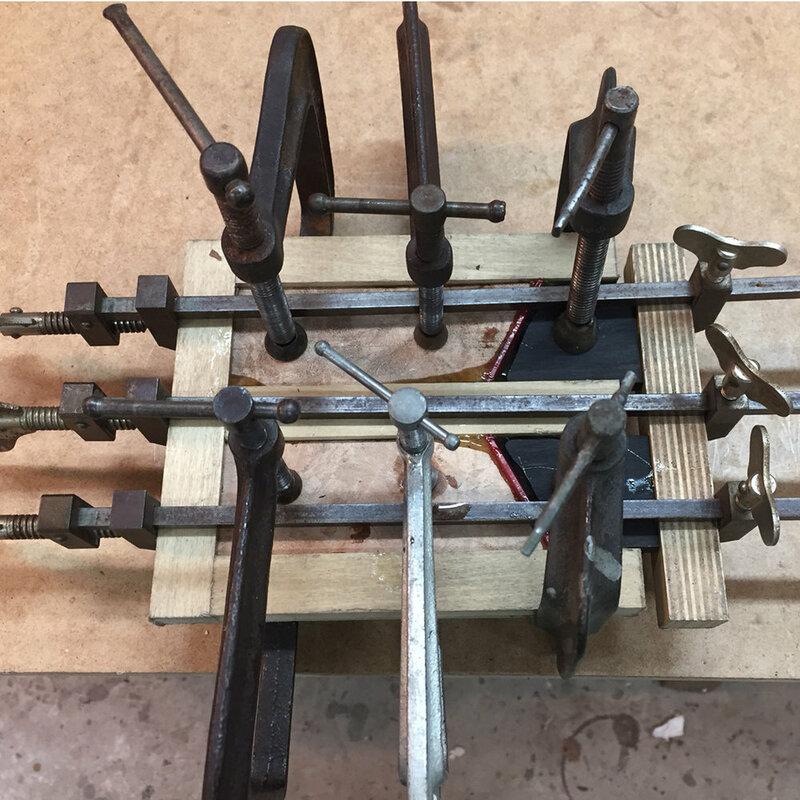 The components of the scales are glued and clamped. Missing a picture or two in the process but here the scales have been glued and pinned to the blades and roughly shaped to the outline of the handle. Next the handles, with files, chisels and abrasives, are carved to their final shape. And finally, over the course of a week or so successive coats of finish are applied and we're kitchen ready.